The 'Jardins de la fontaine' in Nîmes is one of my favorite parks, and a perfect example of the elegant landscape architecture of 18th century France. Built in the reign of Louis XV it is also the first public garden in France. It is a peaceful and beautiful space with a symmetrical layout, filled with fountains, balustrades, vases, and sculptures. You see fish in the pools, and on the weekends, children riding ponies and men playing boules. handcrafted with semi precious stones, freshwater pearls, crystal, glass and crimp beads. The park is so much more though than a peaceful garden for reflection or a promenade. It is such an inspirational place too... it's classical beauty and the abundance of urns and vases, all draped with bows and wreaths, led me to the new 'Jardin de Nîmes' cover for the scarf travel pochette, which will become available in about three weeks time. The design originates from the Boudin Archives in Nîmes, and like the existing Toile de Jouy and Bastide, it is one of the beautiful patterns printed by a family business in Provence. Wow!!!! I'm speechless again! Only you could create such a gracious and wonderful post dearest Mai Tai, You look absolutely stunning in that beautiful black dress and your new necklace is so pretty and looks terrific on you <3! Love the perfect combination of a baroque necklace on the classic background of a petite robe noire, indeed very much in the spirit of 18th century France. Nîmes is so beautiful, I have never been to the Jardins de la Fontaine, as one tends to overlook that aspect of the city with all else it has to offer from its Roman origins to its strong provencal identity. This is such a beautiful look, one of my favorite entries, and welcome to Ms. Gemstone, a most wonderful addition to a most original and lovely collection. The garden is so very beautiful and elegant, no wonder you immediately thought of Paris! Lovely new products and such a pleasurable post! It's nice to see you in a dress. Just as one would expect, you have beautiful legs, if I may say so. So kind of you to say, many thanks :-) I don't wear dresses often, but this one I love.. it's so simple and comfortable. Hope you can visit one day! Votre nouveau collier est superbe et tellement classe avec la petite robe noire ! Wow,wow and WOW! What a beautiful little 'gem' to wake up to! The gardens,those legs,and the stunning new gemstone necklace....perfect in every way! Hurrying over to purchase before these babies are gone! I am in awe....really! Cannot think of more to add except perhaps to find out if a bracelet is in the works! Home run, slam dunk again most talented MT! I am cyber Monday shopping already with MT Collection! Believe me, that necklace is even more beautiful "in the flesh" and so are the legs. Could I please order a pair . . . of the legs. And, I agree with Sanne, that gorgeous collar in more colors would be most appreciated. Ah, I understand now (after some "thinking procedure"), you saw the necklace in reality and you are one of the friends who participated the outing! I can at least say I envy you for the trip and insight into necklace :-). You surely had a wonderful time together! Much love to you, my clever and witty friend! This is a beautiful necklace against this charming and enchanting park. I agree with what others have said, you have fabulous legs and need to show them off more often. The necklace has such fetching colors and fits so well into the setting. Well-done. The scarf travel bag is lovely as well. Dear Maitai, I love this jewelled collar arrangement, it is exactly the sort of thing I'd wear myself. Luff how orginal and elegant your always are. It will, with time, dear Christina. Thanks so much for the lovely comment! Ho Ho Ho.... what can I add except that I found nice Christmas gifts to think about! (speaking of collar and pochettes, of course! Legs' order will be for next spring ;) Amitiés. Many thanks for the info :-) I've seen the Galop Chromatique last week, and as so often the colors are different IRL than on h.com. On their site, the lighter stripes appear in cool shades of greys, white and beiges, but in reality they have pastel undertones (pink/powder blue). What a gorgeous necklace and what a wonderful park! 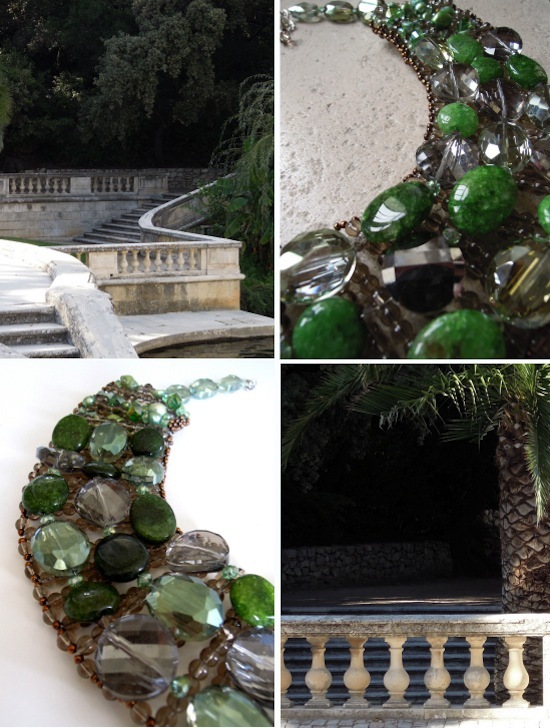 The colours of the necklace really reflect the beautiful greens of the trees and plants. And you look stunning as always dear Mai Tai! Love that dress and your shoes and your bag...everything! So simple and so stylish. And I adore that new fabric for the scarf pochette too. It really does reflect the elegance of the park. I love seeing the new additions to your collection! Oh, this beautiful necklace is definitely going on my Christmas list. So lovely! May I ask who makes your terrific black dress? My old standby black merino shift from Uniqlo (why didn't I buy 10??) was sadly shrunk in the laundry. Looking for something to replace it asap. Thanks so much!! Fabulous, thank you so much! !